In 2010 I visited Mars. 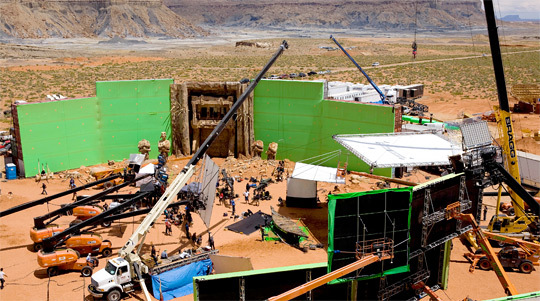 Well, not exactly the red planet 63 million miles away, only the set of John Carter, the live-action Andrew Stanton-directed adaptation of Edgar Rice Burroughs' classic sci-fi stories. The actual location was in Big Water, Utah, right on the northern Arizona border. They had found natural red locations in the rocky, desert region that looked a lot like Mars already and built big sets to look like stone-carved buildings that had been there for hundreds of years. That was where we visited, and this was nearly two years ago in April of 2010, when Stanton and his crew were hard at work actually shooting the movie. It's always odd looking back at a set visit that occurred so long ago as the movie is being released, but that's exactly what's so fascinating about the process. Andrew Stanton, a Pixar director making his live-action debut, had started shooting this sci-fi just before Avatar had been released. 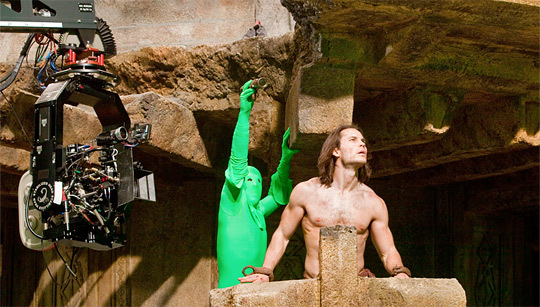 They were using the same technology as Avatar to shoot and record the actors playing the Tharks, the 9-foot tall green martians that are one of the three dominant races that inhabit Mars, which will from now on be referred to as Barsoom. It's the classic name for Mars from Burroughs' books, and it's the name the inhabitants call their planet. This early shoot gave the cast & crew all the time they needed to work on effects, finishing editing, reshoot if necessary, and make sure this turned out exactly how they wanted it to, without too much pressure on time. "The approach that I finally decided on was that it should feel like a period film. It should feel like it's historically accurate to everything that really does happen on Mars, as odd as that sounds. It's the same way that I might watch a film about a civilization that I didn't know about in the deep regions of South America or the Middle East of Asia. If it's done in the right way, maybe I'll go, 'Wow! Maybe that's how it really is on Mars.' I'll sense these layers of history that go behind it and that go unexplained." The experience of visiting this set truly was like going to Mars, which is why I started with that comparison. One of the actual sets that we were allowed to walk through was a Thark encampment located in an old city made of giant stone buildings that had been made to look like they'd been there forever. It looked stunning and just walking through it truly felt like being instantly transported there. The magic of the movies, right? Especially when they actually go to the lengths to build this stuff by hand and use as the set (instead of all greenscreen), since later on they'll be adding in hundreds of CG Tharks that are meant to act and move like they were there when they were shooting, too. It may have been made mostly of wood, but it looked like real Barsoomian stone, even in person. I wish everyone could experience what it was actually like to be there. Our visit took place on day 71 on their 100 day principal shoot, which means this was a massive project, and Stanton and Disney went all out to make sure it was realized in a truly epic grandeur befitting Edgar Rice Burroughs. The sets we visited were a solid mix of greenscreen backing, CG markers, large actual set pieces, real landscapes, Thark mannequins as visual height/location markers, and more adornments to complete the dusty, historic look. Stanton says that about half the world will be made digitally later. Specifically, "the extension of worlds and the extension of sets. These things that are so massive and fantastical that you can't build them." While it looks pretty good now, I'm sure it's going to look even better in the finished film. The second full set we visited was about a short 10 minute bus ride away, a giant desert plain surrounded by a half-circle of rock cliffs rising up on one side. Again, it looked like Mars, but there were only a few old city remnant pieces scattered around this time. Other pieces included burning wreckage that they were using to shoot nighttime scenes with later in the week. It was here where we got to meet a Thark in person, which were actually esteemed actors wearing grey leotard motion capture outfits with black & white markings, facial capture rigs with tiny cameras on arms that stuck out like tusks, standing on 3-foot-tall stilts to make them 9 feet, with a spotter nearby to help them sit down or incase they tumbled. One of them was Willem Dafoe, playing Thark leader Tars Tarkas, who shot a few scenes then spent a few minutes talking with us. Dafoe had been shooting a scene with Taylor Kitsch as Carter from early in the movie. "There's just been a battle and the John Carter character has helped us in the battle, kind of by accident, unknowingly. So, I'm embracing him as one of our warriors and he's very reluctant," Dafoe explains. His last line before cutting, delivered with all the same gravitas you'd expect even in a grey leotard at 9-feet-tall, was simply "now… to the plunder!" It's impossible to forget what it was like watching that in person. Stilts weren't the only technique they used for the Tharks martians, as they showed us a variety of filmmaking gimmicks they had devised: from the typical molded-head-on-a-stick to a backpack the actors wore with a head mounted above them at the right height. It's certainly a huge challenge to bring to life a world full of multiple martian races. "Each time it's a new challenge because the terrain's different, the quality of the sand's different, but it's very important because that height relationship not only helps technically with direct eye lines when mixing effect-oriented stuff with real actors, but also you find the voice much better and you play the scenes much better when you're that character. […] I prefer shooting on location, just because it always helps you. You go some place, you put your life on hold even more than when you've settled in some place. You can make a new life so it opens yourself up to the make-believe and the imagination in a way when you aren't burdened by things that remind you of your life all the time." As he says, it was wonderful to actually see them find amazing natural locations like this (on Earth) and shoot right there. While that pays off on screen in the final movie in how great it looks, what you don't see is all the work that went in to making it all happen smoothly. Not only from the massive crews keeping everyone hydrated, cool, fed and healthy, but also to the water trucks constantly driving around keeping dirt down on the ground, plus of course security scouts making sure no one is snapping any photos. "You want this to just be a great movie that people come to see and enjoy the character and the ride of it. Once you start immersing yourself with that, then hopefully everything else will just kind of set in the way it should be," star Taylor Kitsch says. He was just leaving set so we didn't speak with him long (full transcript here). While we spoke to Andrew Stanton and the producers about the scope of the story and just how much of Burroughs' world they'd be getting into, there was much they didn't reveal. It turns out what we saw was just a small glimpse of what's in this massive sci-fi Barsoomian movie, scenes which actually take place only in the first half. Kitsch gives a good hint about the scope: "A month ago I was surrounded by 360 green on a one-man flyer with wind machines, so you come out here and it really does start to feel like an epic adventure movie. 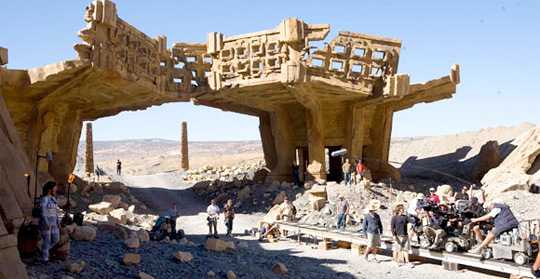 We are on Lake Powell and there are all of these crazy great set designs." We got just a small glimpse of that in our visit to Utah, but with John Carter almost finally here, we can see all of it soon. "I used to laugh because it seemed like, in every chapter, there was the sentence, 'And then I fought the greatest battle of my entire life.' I went, 'That can only happen once, technically!' We decided, hey, it's an action movie. It's probably going to be two hours, two hours plus… I want every single battle to move the story forward. I want every single conflict to feel like it's different and special. You certainly want it to compound and feel like you haven't blown your wad early. You don't want the best thing to happen in the middle of the beginning of the film. We worked really hard to make tentpole scenes of conflict and saved or combined things to make them that much stronger. Because there was a lot of fighting to choose from. But we're trying very hard to make them feel like they felt in the books. For me, it was equal amount thrill of adventure and equal amount romance. At the end of the day, I felt like it was a romance. I've really tried to make that the bigger thread through the whole thing." From our brief glimpse at the set in 2010, it looked like Stanton was at least achieving one thing: creating an epic sci-fi movie that was going to be full of adventure and thrills on a massive scale. We would have to wait a year to find out what the Tharks actually looked like, what Woola—Carter's lovable pet martian creature—looked like, and how it would look when Carter leaped due to the change in gravity. But looking back, it was unforgettable experience. We traveled by plane, by van and bus, and finally by foot into the deserts of Utah to be transported instantly by the magic of the movies to the plains of Mars, for a rare and unique glimpse at the filmmaking process. As well as a glimpse at a talented director making his live-action debut adapting one of the most influential science fiction novels ever. An experience I wish everyone could have. Andrew Stanton's John Carter (of Mars) finally arrives in theaters starting March 9th. It's been a very long journey for Stanton, Disney and everyone else who has worked on the movie, but after all that hard work, they're finally ready to share this exciting adventure with us. Lost in Our World. Found in Another. What a great insight into your unique experience! Thank you for sharing. Definitely can't wait till Thursday!!! and so it becomes obvious how they spent $200 million. I thought it was closer to $300 million. The trailer doesn't feel like I've been taken to Mars as much as I've been swept to Monument Valley into a world of muppets.